The Books for Walls Project: Save Troy Library Tuesday: Vote YES for Libraries! 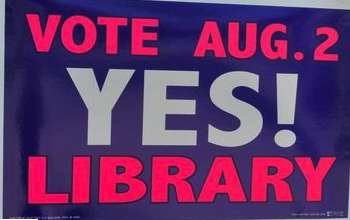 Save Troy Library Tuesday: Vote YES for Libraries! to use their Public Library! This morning The Dad and I were just enjoying a few moments of quiet. We've had house guests for several days, The Sisters are heavily involved with Lakeside Shakespeare, it's The Dad's busy season, oh that's right, it's Summer. How does a busy family help support libraries? 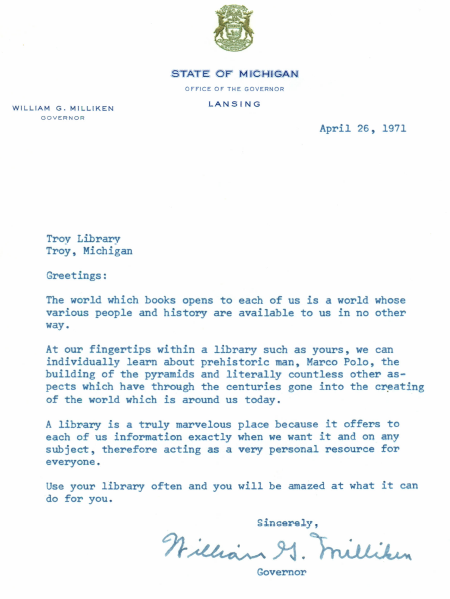 How, in particular, can we help Troy Public Library to win today's Millage Election? We drank our tea and thought about voting. Voting isn't exactly a hard thing to do: learn about the facts of the election, make an educated decision, then get out and VOTE! But wait, lately it is so difficult to get the facts. How can a citizen remain informed? Where is the best place to get informed? Television? The Internet? Maybe. Where can anyone go to learn anything about everything and everything about anything and learn how to access all that information with the help of a staff designated to serve Y-O-U? The Library! For us, keeping libraries open is all about access to information, for everyone and The Sisters add, "it's simple, we love libraries." How about you? Do you love libraries? Want to help? If you don't live in Troy, Michigan --you can still vote for libraries today! Stop by your library and use it! Find the nearest library. Don't have a library card? Learn how to sign up for yours, today! If you do live in Troy, get informed and vote! Read all of our posts with handy links to information. Note: information we share is in support of libraries because that is what we do! Where to vote? Click here and find your polling place! Today we are rooting for the Children of Troy and have a good feeling that more people will vote YES and TPL will remain open. Listen to this sweet Interlochen Public Radio segment with The Sisters and big Troy Library fans, the Yashinsky Family. We think the future of libraries would bright if we left it up to the kids!! 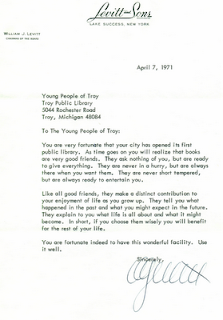 "Forty years ago, in May 1971, the Troy Public Library at 510 West Big Beaver opened its doors to the public. 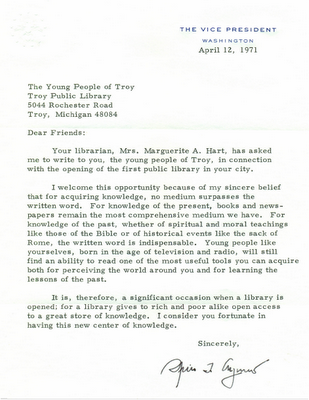 To honor that occasion, then-Troy children's librarian Marguerite Hart wrote to dozens of actors, authors, artists, musicians, playwrights, librarians, and politicians of the day. She asked them to write a letter to the children of Troy about their memories of reading and of books, and the importance of libraries." 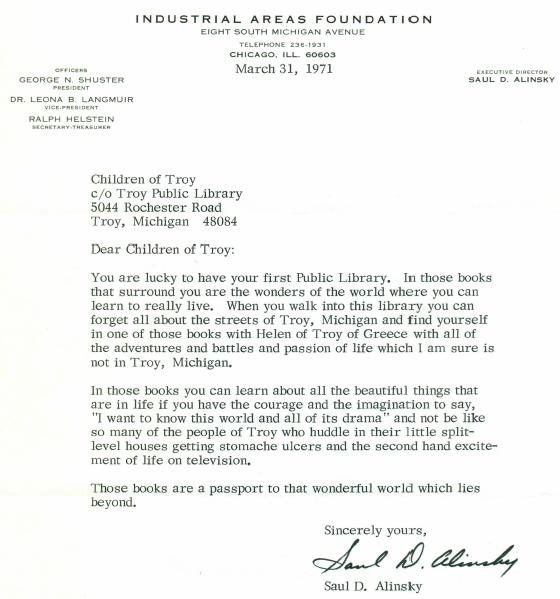 Enjoy these voices from the past, Letters to the Children of Troy, preserved thanks to Troy Public Library! 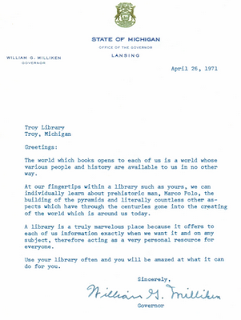 "A library is a truly marvelous place because it offers to each of us information exactly when we want it and on any subject, therefore acting as a very personal resources for everyone." 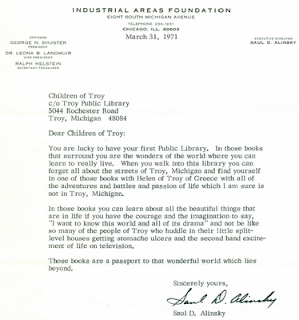 "When you walk into this library you can forget all about the streets of Troy, Michigan and find yourself in one of those books with Helen of Troy of Greece with all the of the adventures and battles and passion of life which I am sure is not in Troy, Michigan." "A single person, even a millionaire, can't have all the books he needs or wants or sees, for he hasn't the space and often the money, so where does he go? To the library." "One of greatest powers we have against the forces of ignorance is the public library. IT knows no racial or economic boundaries. All who enter are welcome." "in a library you get to listen and think for yourself. You get not only entertainment but a chance to find out all sorts of interesting and important things and you get different points of view. Books give you a chance to get the facts, to find out what different people think, and then make up your own mind." 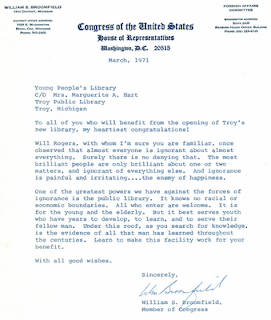 "You are very fortunate that your city has opened its first public library. As time goes on you will realize that books are very good friends. They ask nothing of you, but are ready to give everything." 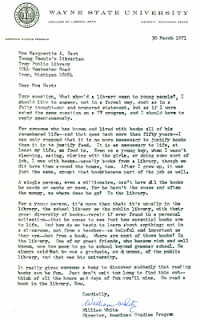 "A library gives to rich and poor alike open access to a great store of knowledge." Please take a moment and support libraries! The Books for Walls Project thanks you! We just got word that voter turnout looks GOOD! We'll report whatever we hear! Keep spreading the word!! VOTE YES Troy Michigan! The Sisters go to bed HOPEFUL! !